Since I discovered the awesome quinoa grains I experiment with different recipes I usually used rice for. 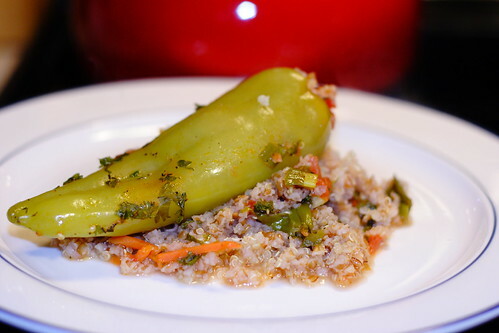 Stuffed peppers is one of my kids' favorite and I decided to substitute the white rice I usually use with bulgur and quinoa. It turned out better than I expected and I decided to share this recipe with you! 1. Wash and clean the bell peppers from the seeds.Keep the pepper whole, because you'll stuff them as ice cream cones. 2.In a large skillet with a lid heat the 3 tbsp of olive oil, then add the chopped onion and sliced garlic. When the onion becomes golden in color add the carrots and stir fry for a minute. 3. Add the bulgur and stir constantly, add the quinoa and then add the tomatoes and parsley. Salt and pepper to taste, then add the water or stock. Stir well, place the stove on low and put the lid of the skillet on. 4. Remove the skillet from the stove after 5 minutes with the lid on, then with a spoon fill the peppers with the mixture. Place the peppers in a greased baking pan. 5. You'll have some of the mixture left, spread it around the peppers. Add one cup wine and place in the oven. 6. 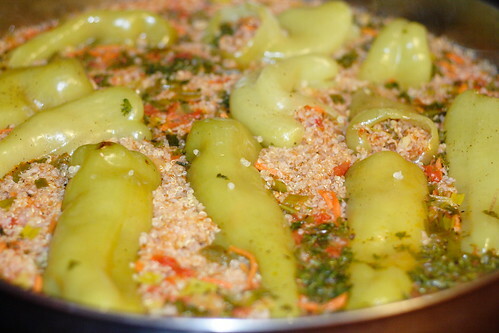 Bake for 20-30 minutes or until the bulgur is done. Serve warm with fresh parsley, yogurt and/or feta cheese. * Note: you can make a mixture of yogurt, eggs, cheese and flour to spread on top and then bake for 10 more minutes or until it is golden on top. My kids prefer it without that's why I didn't do it. Знаеш, че не ти разбирам текста /срааааам/ но на вид са изключително апетитни! Пепи, аз не преведох, защото са обикновени пълнени пиперки, но вместо ориз слагам булгур и киноа ( убий ме не знам как е това на български/срааам/;-). Do you like caramelized Pineapple?